Celebrities, particularly female celebrities, are routinely criticized about their appearance—indeed, celebrity "fat-shaming" is a fairly regular pop-cultural phenomenon. Although we might assume that these comments are trivial and inconsequential, the effects of these messages can extend well beyond the celebrity target and ripple through the population at large. Comparing 20 instances of celebrity fat-shaming with women's implicit attitudes about weight before and after the event, psychologists from McGill University found that instances of celebrity fat-shaming were associated with an increase in women's implicit negative weight-related attitudes. They also found that from 2004—2015, implicit weight bias was on the rise more generally. Explicit attitudes are those that people consciously endorse and, based on other research, are often influenced by concerns about social desirability and presenting oneself in the most positive light. By contrast, implicit attitudes—which were the focus of this investigation—reflect people's split-second gut-level reactions that something is inherently good or bad. "These cultural messages appeared to augment women's gut-level feeling that 'thin' is good and 'fat' is bad," says Jennifer Bartz, one of the authors of the study. "These media messages can leave a private trace in peoples' minds." 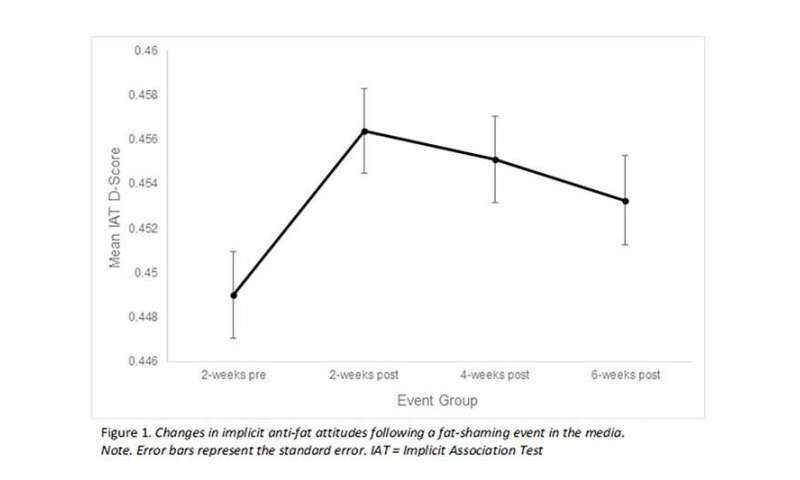 They analyzed women's implicit anti-fat attitudes 2 weeks before and 2 weeks after each celebrity fat-shaming event. Examining the results, the fat-shaming events led to a spike in women's (N = 93,239) implicit anti-fat attitudes, with more "notorious" events producing greater spikes. "Weight bias is recognized as one of the last socially acceptable forms of discrimination; these instances of fat-shaming are fairly wide-spread not only in celebrity magazines but also on blogs and other forms of social media," says Amanda Ravary, Ph.D. student and lead author of the study. The researchers' next steps include lab research, where they can manipulate exposure to fat-shaming messages (vs. neutral messages) and assess the effect of these messages on women's implicit anti-fat attitudes. This future research could provide more direct evidence for the causal role of these cultural messages on people's implicit attitudes. The differentiation between behaviour and genetic predisposition can be seen in crowd photographs a century ago compared to moderns and Americans compared to countries where the weight problem is less severe.